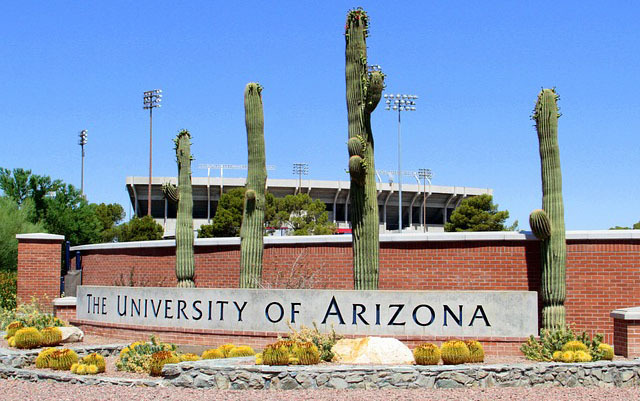 PHOENIX — Even though a week has passed since news broke of FBI arrests related to an NCAA kickback scandal, the University of Arizona and many of its college basketball peers remain a part of the national discussion. Wildcats coach Sean Miller will make his first public appearance Thursday when he meets the media to discuss the start of practice. He will “only be responding to basketball-related questions,” a university spokesman said in an email. While the university continues to show support, allegations appear to be impacting the program. Simisola Shittu, a five-star Canadian power forward in the class of 2018, canceled his Nov. 3 visit to the school, as first reported by zagsblog.com. Canadian forward R.J. Barrett announced on Saturday that his top three schools were Oregon, Kentucky, and Duke. Arizona and Michigan were a part of his original top five. Bill Frieder, the former head coach at Arizona State and Michigan, said part of the reason programs have problems related to kickbacks and unsavory recruiting tactics is because of the level of talent these athletes have. One of the outside firms hired by Arizona is Steptoe & Johnson LLP, whose investigative team is led by former U.S. Attorney for the district of Arizona Paul Charlton. The firm will be investigating allegations against the university that were presented in the federal complaint, along with any issues or concerns that arise from the complaints. Phoenix-based firm Jackson-Lewis has been hired to deal with NCAA issues that might arise from the federal complaint. Attorneys Gene Marsh and John Long will handle the case. Marsh is a former NCAA chairman on the infractions committee, serving from 1999-2008. Long is a former NCAA compliance officer. Dave Heeke, the athletic director, also released a separate statement in support of Miller. The FBI claims that Richardson took $20,000 in bribes from a sports agent to give to a recruit who is believed to be Jahvon Quinerly. If it can be proven that Quinerly took the money from Richardson and the sports agents, he likely will lose eligibility for his freshman season. If the NCAA decided to impose sanctions, they could do so for things such as failure to monitor NCAA rules. The federal complaint also states that a former assistant at Arizona, who is believed to be Joe Pasternack, had multiple conversations with the same sports agent who is later accused of working with Richardson to bribe players. Another part of the federal complaint noted an Adidas representative claiming that Arizona had offered a five-star recruit $150,000 in return for their commitment. The Wildcats have still not announced a replacement date for a media day that was canceled. Miller is expected to make his first public appearance at Pac-12 Men’s Basketball Media Day in San Francisco on Oct. 11. The Wildcats are still set to hold their annual Red-Blue game on Oct. 20, and have a home exhibition game scheduled for Nov. 1 against Eastern New Mexico. Next Tuesday, Richardson is set to make his first court appearance in New York.